Bachhuber Manufacturing, Inc. is a custom machining facility, specializing in CNC turning and CNC vertical machining center work. Bachhuber is also well equipped for general machining operations such as milling, drilling, tapping, and sawing. 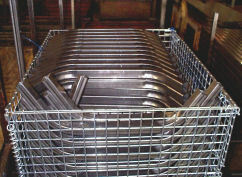 In addition, we have a unique capability combining production tube bending and machining into one operation, send in your quotes today. Bar Stock: Carbon Steels, Stainless Steels, Aluminum, Tool Steels, Plastics, etc.